The recent integration of new developments in electron microscopes, direct electron detection cameras, and advances in image analysis methods are allowing the expansion of high resolution structural molecular biology in new and exciting directions by direct visualization of macromolecules and their complexes. The next decades will be dominated by the study of protein-protein, protein-nucleic acid complexes, molecular machines, and their conformational changes in ways that were impossible before due to their size and/or the need to study them in crystalline form. In addition, developments in many aspects of electron microscopy are providing new tools for the study of biological molecules from the single molecule to the cellular level. 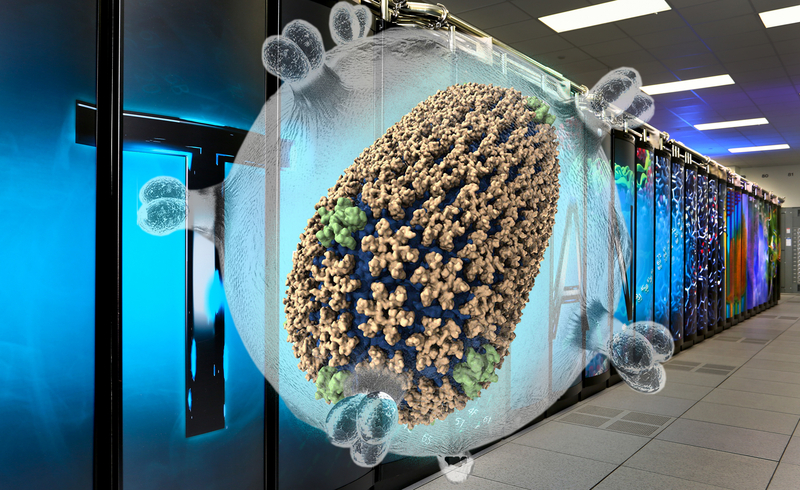 The inaugural workshop on Advancement and Challenges of Biological CryoEM will address key developments in this fast advancing field, provide an opportunity to discuss the state of the field and exchange views on advancement and challenges of biological cryo-electron microscopy, and foster the research collaboration of biological and biomedical sciences, particularly in Hong Kong, China, and Asia. The workshop will be hold the day after the GRC Conference on three-dimension electron microscopy in Hong Kong, which is the premier cryoEM meeting, to encourage the participation of GRC attendees. Every other year, as part of our NIH sponsored Membrane Protein Structural Dynamics Consortium we gather in Chicago for a conference to discuss the most exciting aspects at the frontiers of membrane protein structure functional and dynamics. We (and the NIH) see this as gathering of the leaders in the field and a great opportunity to interface the advances of the Consortium with the community at large. We are happy to announce the newest version of our very successful “Frontiers in Membrane Protein Structural Dynamics” meeting. It will take place on November 10-12 at the Advanced Photon Source Conference center at Argonne National Lab. We are still finalizing the program but it is expected to have a full slate of very exciting talks. The conference will begin on the evening of Friday, November 10th and end in the afternoon on Sunday, the 12th. There will be a total of 8 symposia sessions, and two keynote talks, bookending the meeting, plus an extensive poster session accompanied by a “flash session” where poster presenters will summarize their work in 1 slide/2 min micro talks. As before, we hope to encourage attendance of graduate students and post-doctoral fellows by having a low non-speaker participant fee and offering travel awards to students, postdocs, and new faculty. Looking very much forward to have you in the Chicago area in November! We are pleased to invite you to the first edition of the NAMD developer workshop jointly organized by the University of Illinois, Urbana-Champaign and the University of Chicago, and to be held on the campus of the University of Chicago. This workshop is intended to gather the community of NAMD developers for fruitful exchange on current and future developments of the program. It will consist of short presentations aimed at covering practical coding aspects, ongoing developments, architecture specificities, implementations of novel algorithms, as well as broader topics, notably future directions of the program and the parallel programming environment charm++ it uses. This workshop is not intended for scientific presentations about applications, although illustrative applications of on-going code developments would be welcome. For more information and registration, visit this page. The Membrane Protein Structural Dynamics (MPSDC) 2015 Annual Meeting website has been launched, and we are ready to receive registrations! Please note that unlike last year’s Frontiers in Membrane Protein Dynamics conference, this annual meeting is open to Consortium participants and invited guests only. MPSDC Awards: Francisco Bezanilla, Past President presenting an award to Robert Nakamoto. The Membrane Protein Structural Dynamics Consortium is always very well represented at the annual Biophysical Society meeting, with Consortium members actively involved at the leadership level, including Francisco Bezanilla‘s tenure as president from 2012 to 2014, as well as at the level of participants in a remarkably large number of workshops, symposia, and presentations. Emad Tajkhorshid (UIUC) will be chairing the Permeation & Transport Subgroup 2015 Symposium. He is also chairing a workshop on Advances in Computing Large Systems. Olga Boudker (Weill Cornell Medical College) is chairing a symposium on Neurotransmitter Transporters. Christopher Ahern (University of Iowa) is participating in a symposium on Probing Ion Channel Structure/Function Using Novel Tools. Jamies Bowie (UCLA) is participating in a workshop on Stabilizing Membrane Proteins. Ivet Bahar (UPittsburgh) is giving a lecture titled “Neurotransmitter Translocation: Insights from Network Models and Multiscale Simulations” at the Biopolymers in Vivo Subgroup 2015 Symposium. José Faraldo Gómez (NIH and MPSDC Associate Member) is giving a lecture titled “Novel Insights into the Structure and Mechanism of Proton and Sodium/Calcium Exchangers” at the Membrane Biophysics Subgroup 2015 Symposium. Last but not least, MPSDC member and one of our keynote speakers at Frontiers in Membrane Protein Structural Dynamics 2014 Klaus Schulten (UIUC) will give the prestigious National Lecture. The National Lecturer is the highest award given each year by the Biophysical Society. The recipient presents the National Lecture on Monday evening of the Annual Meeting. We would like to congratulate Dr. Schulten on achieving this great honor. See also: interviews from last year’s Biophysical Society with Francisco Bezanilla, Past President and Robert Nakamoto, Chair of the 2014 BPS Program Committee. 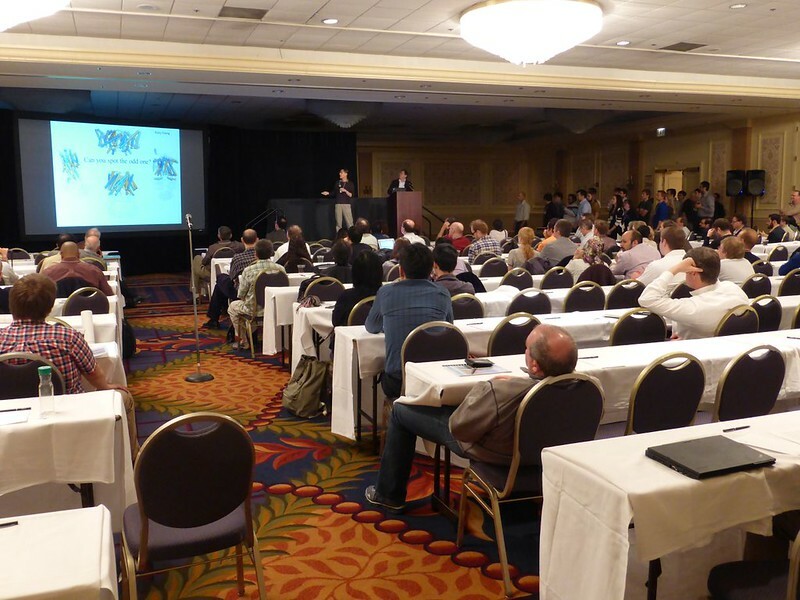 On May 7th, 8th, and 9th, the Membrane Protein Structural Dynamics Consortium (MPSDC) held its second Frontiers in Membrane Protein Structural Dynamics meeting at the Chicago Hilton Hotel. The meeting featured both Consortium members and external invitees, and consisted of eight scientific sessions, poster presentations (and mandatory one-minute Flash! Poster talks), as well as two keynote lectures by Robert Stroud (UCSF) and Klaus Schulten (UIUC). 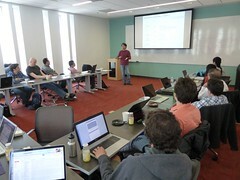 Prior to the conference, the MPSDC hosted several satellite events including a computational modeling workshop, a mini-symposium meeting concerning the latest advances in computational approaches, and a workshop on spectroscopy methodologies. 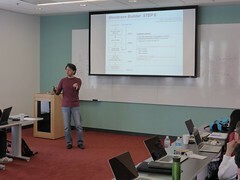 As in previous years, the MPSDC’s Computational Modeling Core hosted a membrane protein modeling workshop, and a computational mini-symposium concerning the latest advances in computational approaches to the study of membrane proteins. The computational modeling workshop was co-chaired by Emad Tajkhorshid (UIUC) and Wonpil Im (University of Kansas) and provided attendants with an overview of the use of the modeling dynamics and visualization software NAMD and VMD, as wel as the CHARMM-GUI Membrane Builter and force field parameterization tools. 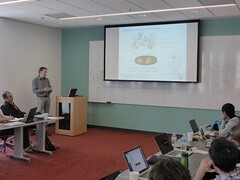 Jeff Klauda (University of Maryland) was also invited to speak about lipid bilayer simulations. This year’s mini-symposium was chaired by Benoît Roux (University of Chicago) and covered a number of topics including methodologies and their applications, voltage gating, and pumps and transporters. This year, the Consortium also organized a spectroscopy workshop, co-chaired by Marc Baldus (Utrecht University) and Yeon-Kyun Shin (Iowa State University). 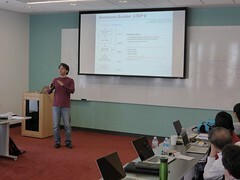 This workshop featured both Consortium collaborators and invited speakers, including Ana Correa (University of Chicago), Tae-Young Yoon (Korean Advanced Institute of Science and Technology), Martin Zanni (University of Wisconsin), Gary Lorigan (Miami University), and Daniella Goldfarb (Weizmann Institute). 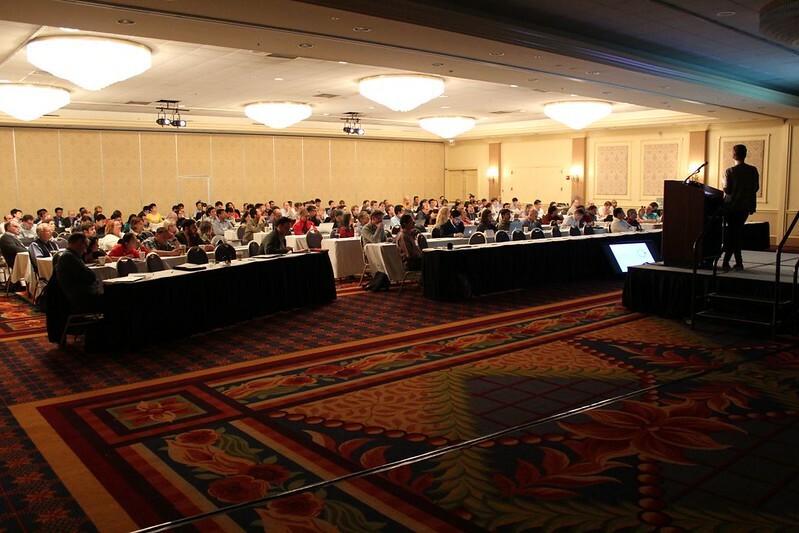 Topics discussed at this workshop focused on addressing techiques in solid-state and solution NMR, EPR including DEER approaches, infrared, fluorescence and single molecule techniques including magnetic tweezers. Both workshops and minisymposium were well attended and productive, and we will continue to host such satellite events in the future. For the first time, we invited two premier scientists in the field of membrane protein biophysics to give a keynote lecture at the meeting. Our first keynote speaker was Robert Stroud, Professor of Biochemistry & Biophysics and Pharmaceutical Chemistry at the University of California at San Francisco. At the Stroud lab, scientists seek to understand molecular mechanisms of certain key biological processes, as well as signal transduction between processes at the level of protein structure, dynamics, and mechanism. In addition to his posting at UCSF, Dr. Stroud is also the director of the Membrane Protein Expression Center, one of the centers funded by the NIH Common Fund Structural Biology Program. The MPEH develops and applies the latest innovative methods yielding structurally and functionally intact eukaryotic membrane proteins for drug development, and structural and functional characterization. Stroud’s lecture was titled Wiggle wiggle – not a trickle: How do Membrane transporters work (to concentrate ions 1000 fold)? In his lecture, Stroud discussed how secondary transporters can drive and concentrate nutrients or ions ‘uphill’ (energetically) across membranes achieving gradients of >1000:1 driven by ‘downhill’ movement of other coupled ions, protons, metabolites or electrochemical gradients. 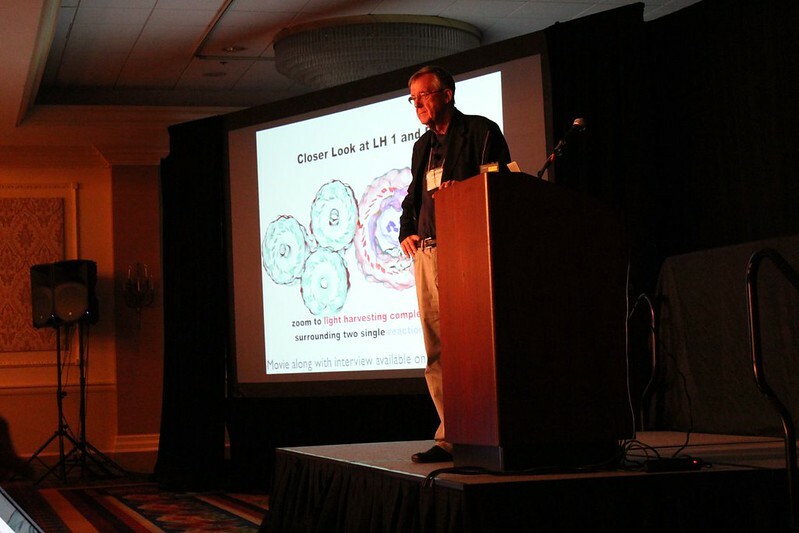 Our second keynote speaker was one of our very own Consortium members: Klaus Schulten, Swanlund Professor of Physics at the University of Illinois at Urbana Champaign. Professor Schulten is a full-time faculty member in the Beckman Institute and directs the Theoretical and Computational Biophysics Group. His professional interests are theoretical physics and theoretical biology. His current research focuses on the structure and function of supramolecular systems in the living cell, and on the development of non-equilibrium statistical mechanical descriptions and efficient computing tools for structural biology. Professor Schulten is a leader in the field of computational biophysics, having devoted over 40 years to establishing the physical mechanisms underlying processes and organization in living systems from the atomic to the organism scale. Schulten is a strong proponent of the use of simulations as a “computational microscope”, to augment experimental research, and to lead to discoveries that could not be made through experiments so far. The molecular dynamics and structure analysis programs NAMD and VMD, born and continuously developed in his group, are used today by many thousands of researchers across the world. Schulten’s lecture was titled The photosynthetic membrane of purple bacteria – An amazing clockwork of proteins and processes. Schulten described a spherical bioenergetic membrane in purple bacteria of 70nm diameter involving 130 protein complexes called the chromatophore. Hundreds of chromatophores provide a bacterium with energy in the form of ATP, the synthesis of ATP being driven by sun light. The overall function in each chromatophore comes about through a clockwork of intertwined physical processes. Schulten presented a computational description of the subprocesses (using the programs NAMD and PHI as well as quantum chemical programs) along with advanced molecular graphics (using the program VMD), in so doing offering an extremely detailed views of the processes mentioned. Schulten showed a VMD-produced video during his lecture, which can be viewed here along with the audio from his keynote lecture. Additionally, we interviewed Schulten about his keynote and a number of other topics prior to the meeting; this interview can be accessed here. 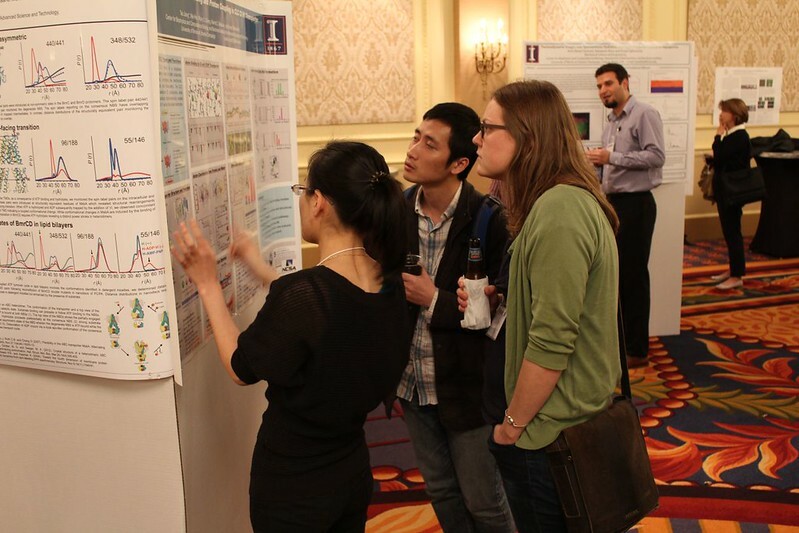 Post-docs and graduate students attending the meeting were invited to bring posters to the meeting, which were displayed in a dedicated room at the Chicago Hilton Hotel. A total number of fifty-two posters were brought to the meeting, representing twenty different institutions and covering an extensive range of topics relating to cutting edge scientific research on membrane proteins. Each of the 52 presenters were asked to give a one minute Flash! Poster talk based on one powerpoint slide that they were asked to bring. These poster talks took place consecutively on Wednesday night, following Robert Stroud’s keynote lecture. Anatrace graciously sponsored a number of travel awards and poster prizes for students and postdocs attending the meeting. Four travel awards ($500) and two poster prizes were decided by a panel on the basis of merit. Winners of the Anatrace awards were announced at the meeting, and can also be found here. The bulk of Frontiers in Membrane Protein Structural Dynamics 2014 took place in the form of eight scientific sessions on contemporary issues in membrane protein dynamics. These sessions touched on topics as diverse as protein engineering for conformational dynamics, stability and folding; structural approaches; energy coupling in transporters. computational approaches to membrane protein conformational pathways; structure and dynamics of divalent ion channels and transporters; computational challenges and strategies; voltage sensing; and movement in ligand-gated channels. As in previous years, we invited both Consortium PI’s and external invitees to foster productive conversations with our colleagues, as well as possible future collaborations. Accordingly, the official meeting program consisted of twenty-five scientists not affiliated with the MPSDC, along with fifteen Consortium team members. To see each of the individual talks, the official program can be viewed here. All panels were well attended and each of the talks were followed by stimulating discussions between speakers and the audience. We’d like to thank all who attended and took part in this year’s discussions, and look forward to seeing you at our future meetings! Below are several photos of the meeting and satellite events. You can either scroll through the photos here or visit the photo set on Flickr. We’ve also made available several brief audio interviews with several conference participants, to be found in the margins of the body of this post. We asked participants about their research, and their views on Frontiers in Membrane Protein Structural Dynamics 2014, what they felt were some of the highlights of the meeting, and if applicable, their recent collaborations with the MPSDC. The Membrane Protein Structural Dynamics Consortium (MPSDC) is hosting two workshops on computational modeling and simulation, and spectroscopy methods. These will take place at the University of Chicago campus prior to the conference. Both of these workshops are designed for young investigators to learn some of the cutting edge tools and methodologies that are frequently used in contemporary membrane proteins research. During the week of the Membrane Protein Structural Dynamics Consortium (MPSDC)’s Annual Meeting, a workshop specifically dedicated to Membrane Protein Modeling will be held at the University of Chicago on Tuesday, May 7th. 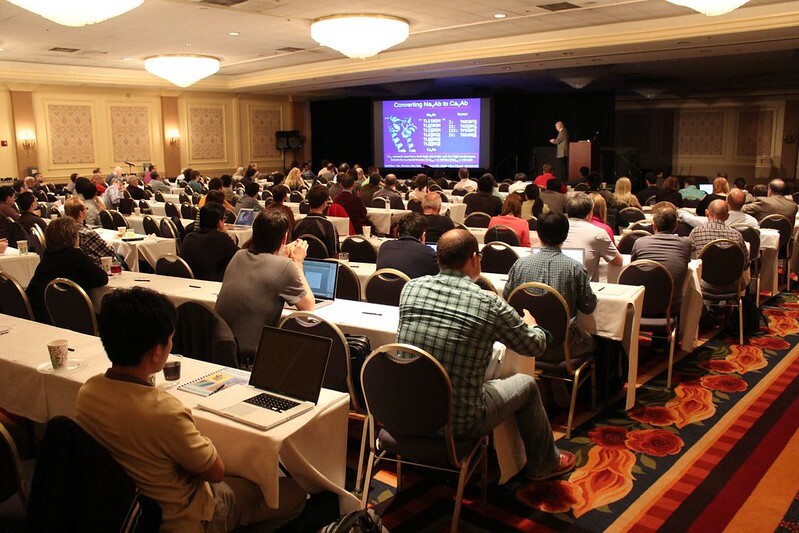 This Workshop is designed to provide an introduction to the most important computational tools and techniques used in molecular dynamics simulations of membrane proteins, including utilization of the programs NAMD and VMD, as well as the CHARMM-GUI Membrane Builder. We will also cover the use of force field parameterization tools. The workshop will include a practical “hands-on” session. 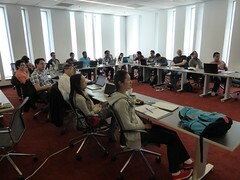 The Workshop is co-organized by the Computational Modeling Core (CMC) of the MPSDC and the Theoretical and Computational Biophysics Group (TCBG) of the University of Illinois at Urbana-Champaign. Emad Tajkhorshid from the University of Illinois at Urbana-Champaign. Wonpil Im from Kansas University. 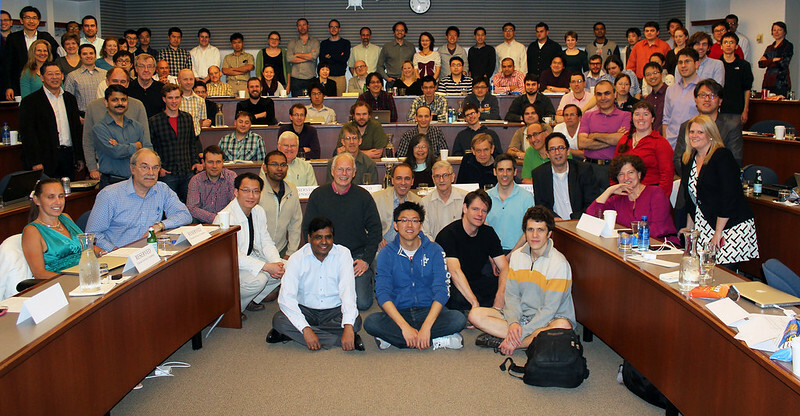 Last year’s CMC Workshop, also held at the University of Chicago. Join us for an afternoon to discuss topics on membrane protein production and modification. Topics will include cellular and cell-free production of membrane proteins, reconstitution, incorporation of unnatural amino acids, single antigen binder technologies, and chemistry of protein modification and nitroxide spin labels. 2:00 Brandy Verhalen, Vanderbilt University, and Yelena Peskova, University of Virginia: Expression in eukaryotic cells and reconstitution into nanodiscs.